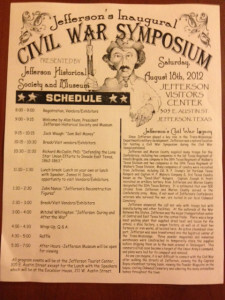 On Saturday August 18, 2012 the Jefferson Historical Society and Museum is hosting an Inaugural Civil War Symposium at the Jefferson Visitors Center. While Jefferson was an important river port during the time of the Civil War it made sense to use it during the war for supplies and even gathering of troops to fight for the Confederacy. Jefferson had a meat plant for food and businesses and factories that were already running so having them make items for the war was a logical solution. Even the Steamboats that already came to Jefferson carrying goods for trade also switched to bringing troops for the war. During the all-day Symposium you will meet and hear from some very exciting speakers. Richard McCaslin PhD is a Professor and Chair of the Department of History at the University of North Texas. Jack Waugh an historian whose works include; Lincoln and McClelland The troubled partnership between a President and his General, Sam Bell Maxey and the Confederate Indians and many more. And two of our own local historians; John Nance who most people will know from boat rides during his tours. 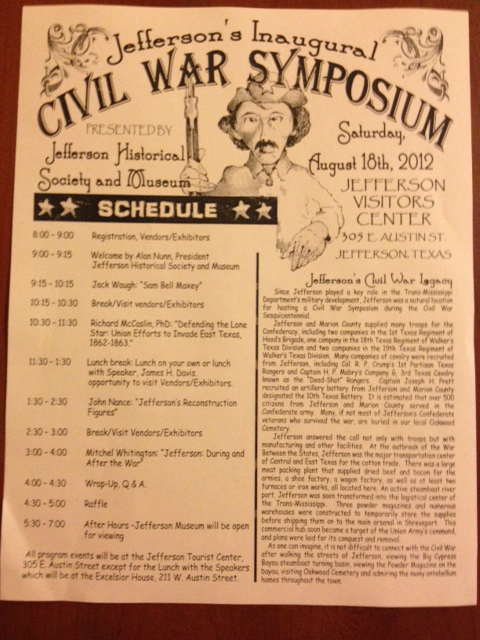 He is a wealth of Jefferson history and quite delightful to listen to. Mitchel Whitington is an author and lecturer who has done extensive research on Jefferson also and written many books about our area. His home is even a local tour home just around the corner from our bed and breakfast in Jefferson Texas. Spend the weekend at our East Texas bed and breakfast and we would like to offer a 25% off special price for Friday night without breakfast on Saturday so you can get to the Symposium on time. Sunday morning relax and enjoy our delicious breakfast at the regular time before your trip home. Call the White Oak Manor bed and breakfast today for this special offer.